Ridley Scott has been quoted several times explaining how heavily inspired he was by the works of Joseph Conrad in creating Alien. The names of the vessels always have strong connections. 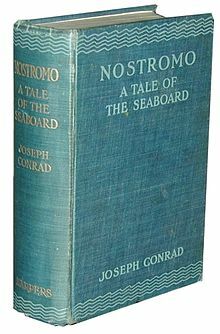 The Nostromo comes from Joseph Conrad's book under the same title. In the novel, the character Nostromo was a charismatic Italian seaman who earned a reputation for leadership and bravery. He was acknowledged as an "incorruptible man". Essentially, he was entrusted with the task of removing silver from Sulaco (Yes, Aliens transport vessel name) to keep it from the revolutionaries. After returning home from this conquest, he was outraged to realize that no one was giving him a pat on the back. This ultimately lead to his destruction. The whole time, he knew of the truth as to what happened to the precious silver, and it consumed him until he eventually returned to Sulaco, where through multiple events he finally met his demise. Nostromo's obsession with the silver always leads me back to Ash's obsession with the Xenomorph. Both characters were sent on strict missions with simple instructions and evidently let their emotions consume them. If anyone has read any other Conrad works, or simply has an opinion on this topic, feel free to comment. I have not read this book but am aware as to it being referenced as ship names. Conrad's influence is prevalent in most, if not all, of Scott's films, but especially in ALIEN. One's struggle to survive in an indifferent Universe... Because the film takes place in alien, claustrophobic environments against a backdrop of infinite, inhospitable Space, it makes that struggle incredibly terrifying. That's a very interesting parallel between the two stories HappyXeno. I like your take on Ash being "obsessed." The Nostromo was hauling valuable natural resources, so they were carrying mineral elements that had been extracted too. The Covenant is also at least partially named after a ship in another book that Ridley likes (can't recall the title). Using nautical ideas as a metaphor for being out in "the great big sea of nothingness" expresses itself through Tennessee's character, in a way. Tennessee's way of looking at the Universe reminds me of a number of characters in stories about people out at sea. It wouldn't surprise me if he goes off chasing the "White Whale" for the Company (if he survives). I've read Heart of Darkness by Conrad and can potentially see aspects of that creeping into the series. It's possible that David does what he does to "send a signal" to the other groups of Engineers - and their followers. He wants them to look upon his works and tremble, sort of like Col. Kurtz. David has been isolated from the Company for so long that he might start behaving in a similar way to Col. Kurtz from Heart of Darkness. Alternatively, I can see Walter representing Kurtz, since Col. Kurtz's full name is "Walter" E. Kurtz. I think that's one of the reasons the name Walter was chosen. David seems more related to the biblical ideas though, and David's story could be more like Lawrence of Arabia, or a mixture of the two. To me, the twin angels in the Covenant logo imply there's a dual meaning to some of the names & symbols.